If you’ve consulted a professional trainer and decided that an e-collar would improve your dog’s training progress, you’re in the right place. We’ve researched and reviewed some of the best-selling dog training collars on the market to help you find the right one for your dog and your needs. But before getting into the reviews, check out these handy specs to consider when buying an e-collar! Breed Size - Many dog training collars on the market today are designed to fit all breed sizes, big and small! Modes - Most training collars have vibrate, shock, and beep modes that can also be adjusted to different intensities. 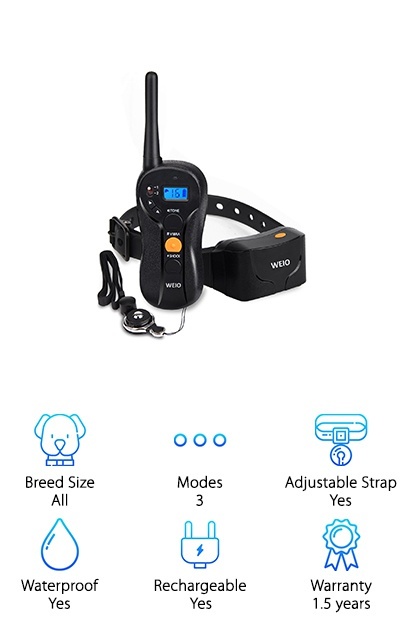 Adjustable Strap - Measure your dog’s neck to find a collar that will definitely adjust to a perfect fit for their needs. Waterproof - Waterproofing is another important feature, especially if your dog loves to swim or roll in the mud. Rechargeable - Don’t get stuck with constantly buying replacement batteries--a rechargeable dog e-collar is the way to go! Warranty - The warranty is often an indicator of a product’s quality, and can be a nice feature for peace of mind. Now that you know what to look for, let’s get into the reviews. If you’re in a hurry, our top pick and budget pick might be all you need--but read them all if you have the time! Your new dog training collar is just around the corner. Try out one of the best dog bark collar for training with the Patpet Training Collar. It has a range of almost 2,000 feet and an IPX7 waterproof rating. That means that if your dog’s a swimmer, this training collar can handle it! Labs, spaniels, and other water-loving dogs definitely need a training collar that can keep up with them. The collar strap adjusts from 10-20 inches to fit most breeds from 10 to 100 pounds. The remote has a backlit LCD and a button setup that makes it easy to operate the remote without needing to look at it. A lanyard is included for hands-free operation at a moment’s notice. The rechargeable batteries are long-lasting and can be charged at the same time with the included split charging cord. It’s no wonder that this product made it to the top of our best dog training collar reviews! 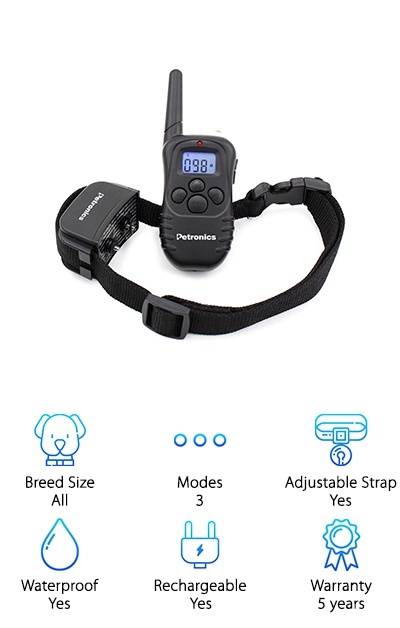 The winner for the best dog training collar with a low price is this option from Petronics. If you have two dogs you want to train at the same time, try out the package option with two collars--convenient, right? The modes include vibration, beep, and static shock to suit a wide variety of situations. The vibration and shock modes can be adjusted from levels 0-100. The stable signal can travel almost 1,000 feet, which is great for those big backyards! But our favorite feature is the five-year warranty, which really helps this dog training collar stand apart from the crowd. The nylon collar adjusts from 14 inches up to 23 inches to fit dogs small and large, from 10 to 100 pounds. If you’re using two collars, you can switch between two channels to target corrections to one dog or the other. The brand Weio offers one of the best waterproof dog training collar options with an extra-long range--up to 600 yards, or almost 2,000 feet! 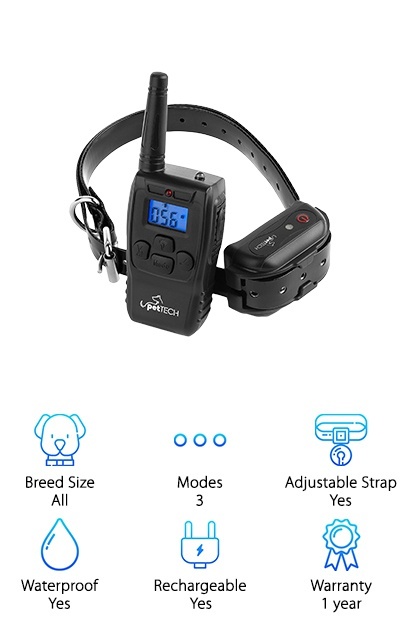 The remote offers adjustable levels from 1-16 for the vibration mode and shock mode, and you can also use the beep mode to get your dog’s attention. The design and positioning of the buttons makes blind operation easy, since you can feel the right button by hand. A lanyard is included so you can carry the remote hands-free instead of fumbling for it in your pocket when you need it. The collar can be adjusted to fit dogs from 10 pounds all the way up to 100 pounds. The remote and collar are rechargeable, and you can charge them both at the same time with the included cord! The convenient design and long range make this a great dog training collar for any dog owner. 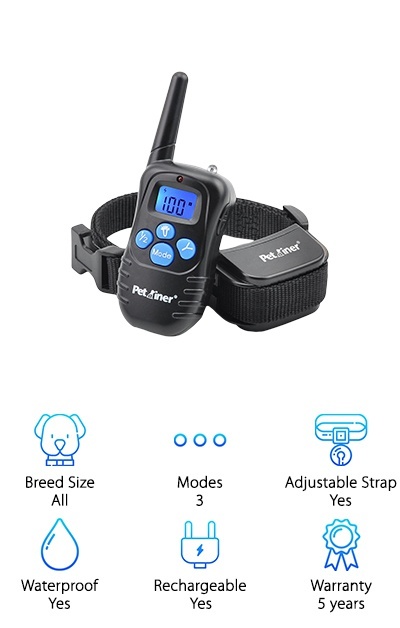 The Petrainer Shock Collar is a top pick for the best dog collar for pulling, excessive barking, and other issues that dog owners commonly face. The reason is pretty obvious: there’s a five-year warranty on this product! 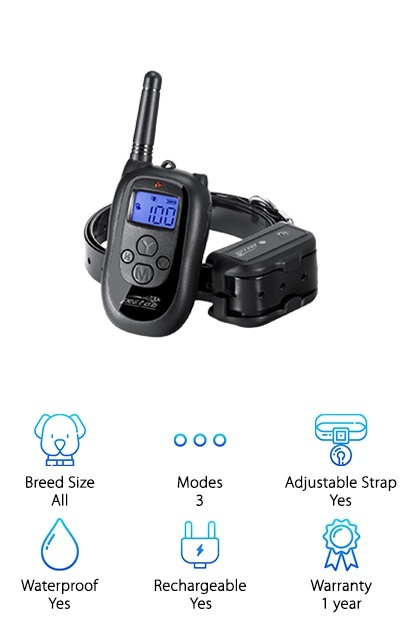 Besides that awesome feature, this dog training collar offers static shock and vibration modes that can be adjusted from 0-100, plus a beep mode. 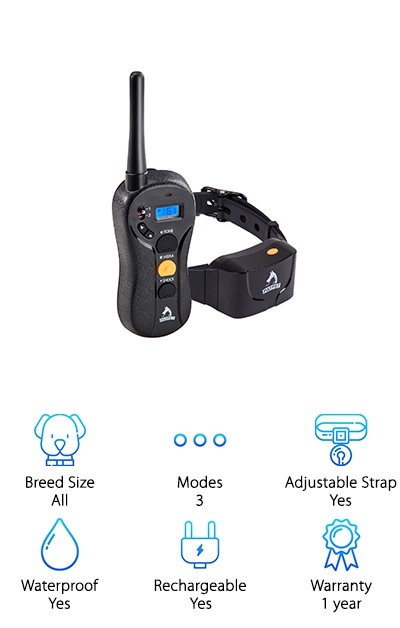 The collar receiver and remote are water-resistant, and the collar can be adjusted from 15 inches to 22 inches. The 1,000 foot range is another great spec that will help you to get your dog’s attention even when they’re at the other end of the backyard. Both the remote and collar are rechargeable, so you don’t have to keep buying new batteries. The blue LCD screen is backlit for clear viewing even at night or in the dark. You can use the remote transmitter with up to two collars, so you can buy a collar separately for training two dogs at once. Are you looking for the best remote dog training collar with an extra-long range? The PetTech Remote-Controlled Collar has a range of up to 1,200 feet! Plus, it has all of the basic features you need for corrective training. The static shock mode and vibration mode can be adjusted from levels 0-100 depending on your needs, and there’s also a beep mode to help get your dog’s attention. The collar can be adjusted to fit a range of neck sizes for dogs 10 to 100 pounds. The collar and remote are also waterproof, so if it starts to rain, you’re covered! The lithium batteries are long-lasting and rechargeable with the included chargers, and a battery level indicator on the remote’s backlit LCD screen keeps you up-to-date on how much juice you have left. The backlit LCD is easily visible even in the dark. The Peston Training Collar features IPX7 waterproofing, so it may be a great choice for labs and other dogs that love the water! It’s one of best dog collar options for training anywhere, anytime. The collar strap can be adjusted from 8 inches to 26 inches to fit dogs from 15 pounds to 100 pounds. The small strap starting size makes it a good choice for small breeds. The lithium-polymer batteries in the remote and receiver can be charged simultaneously for total convenience. Bonus: you’ll never be caught unawares by a dead battery thanks to the battery indicator on the remote’s LCD screen! Use static mode, shock mode, and beep mode for all of your training needs, and adjust the static and vibration intensities from 1-100. The backlit LCD screen is easy to see day or night. 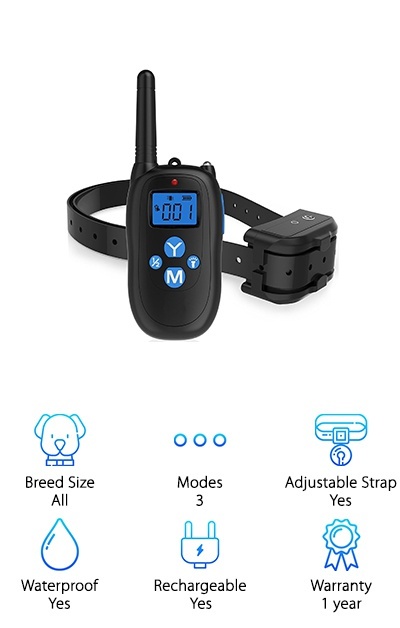 This inexpensive dog training collar has a 900-foot range, too, so you can use it in the yard to discourage barking or for training in the park. These electronic dog collars from DugCandy are easy to use and durable with a rainproof design that can handle bad weather and most doggy adventures. If you’re looking for the best training collar with a low price, DugCandy is a strong contender! 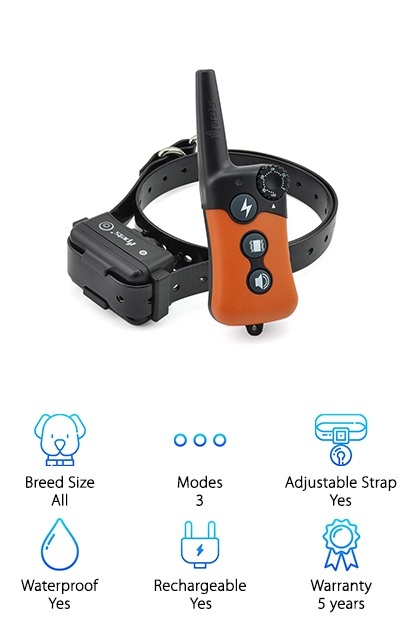 The remote has a range of 900 feet (300 yards) and the nylon collar can be adjusted up to 25 inches to fit dogs from ten pounds up to 100 pounds. The blue LCD shows you the intensity level you’ve selected for vibration or static shock options, and you can also use the beep mode as a warning. Since the screen is backlit, you can use it any time of day or night! Both the collar and remote are rechargeable, and charging cords are included. Keep in mind that this dog training collar is not as waterproof as some other collars available. If your dog loves mud and water, you may prefer a different collar! Take on training like a champ with the Sit Boo-Boo Training Collar. It has a range of almost 1,000 feet and a totally waterproof design made to handle the great outdoors. It features a large LCD screen and big buttons that let you quickly choose and adjust tone, vibration, or shock settings. The rechargeable lithium-ion batteries last even longer with a built-in “sleep mode” function during periods of inactivity. Plus, to get you started, a bonus e-book is included to help you learn training methods and help you through the process! A no-fault, no-hassle lifetime warranty is another nice feature to have on your side, just in case. This dog bark collar fits dogs from eight pounds and up, so it should be suitable for most small to large breeds. The customizable settings let you tailor the collar’s feedback to the situation and your dog’s personality. 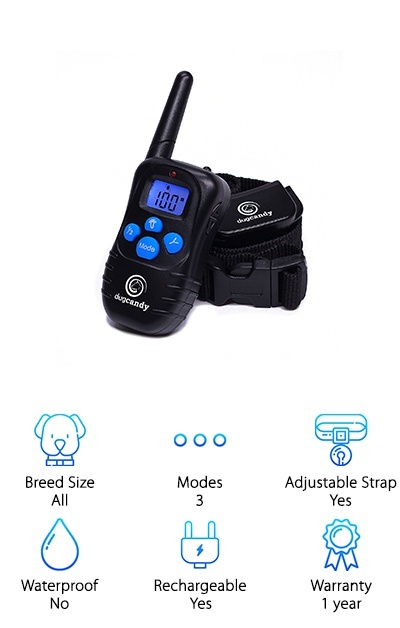 The ALZN Remote Controlled E Collar for dog training is a 100% waterproof collar with a range of up to 330 yards (900 feet) for training just about anywhere. The collar is adjustable from 7’’ to 26’’ to fit a wide range of dog breeds and sizes. This is one of the widest collar fit options on the market! The remote control lets you select from a beep mode, vibrate mode, or shock mode. The vibration and shock modes can be adjusted to 100 different levels. The remote and collar are both rechargeable and durable. A battery display on the remote means you’ll never be caught with a dead battery when you need it most! This is a great option for training in the backyard or in the park thanks to the long range and rugged, outdoorsy design. 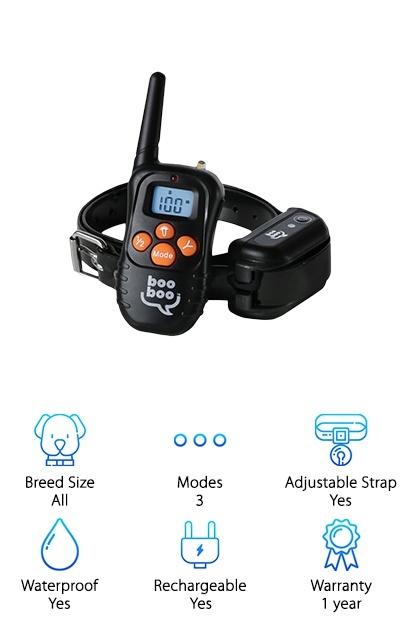 This basic electronic dog training collar is simply designed and easy to use, and it comes with a one-year warranty. The iPets Shock Collar is designed to fit small to large dogs with a collar adjustable from 6.3 inches up to 25 inches around. The wide adjustment range makes this a good choice for small dog breeds. The remote is designed to make training fast and easy with a stimulation level dial and separate buttons for sound, shock, and vibration--no need to waste time toggling between modes by pushing the same button. The beep, shock, and vibration intensities can all be adjusted separately depending on your needs. You can charge the collar and remote simultaneously with the included wall charger. The collar is waterproof while the remote is water-resistant. The remote works up to a 900 foot range (330 yards), so it’s a great choice for larger backyards or training in the park! This collar setup is designed to meet the needs of a wide range of dogs and owners, acknowledging that one size does not fit all!